I’ve gotta admit I’ve been feeling pretty horrible these last few days. I’ve was slammed with a sudden flu like something and then the shooting in Las Vegas hit way to close to home. It feels more and more like the world has gone mad. I don’t write this blog to get into politics, but how I feel definitely directs my posts. I’d planned to write up a project I made for myself, but instead I’m posting a project that I’ve been working on for over two years. Something warm and happy and lovely. I’m a pretty big fan of Heather Ross prints. I keep an eye out for her prints on apparel fabric for me (exhibit 1 and exhibit 2) and when the collection is something special I buy quilting cotton too. The Tiger Lily collection came up for pre-order when I was all high on newborn baby fumes and I was inspired to make sister quilts for my tiny and tough girls. I loved the mix of ballerinas and girls climbing trees. Now I can finally call the project a wonderful and finished success. These suckers were quite a bit of work. Churn dash was the only block pattern I even really considered. It just seemed to suit the fabrics so well, but trying to figure out which prints to pair took me many many evenings. Early on in the planning process I realized I didn’t have enough fabric and had to desperately email Westwood Acres Fabric to order a bit more! I also originally thought I’d make the tops with different mixes of fabric, but I couldn’t ever quite figure out how to make it work in a well balanced way. So both tops are identical. Well, the tops are identical except one one very special detail. I hand embroidered their names in the sashing. Even this detail took a lot of thought. Originally I’d planned to have them machine embroidered, but then I was too lazy to actual research it after my friend with an embroidery machine said her machine couldn’t handle the size of the project. The big push came when my local yarn store announced they were getting rid of embroidery floss and I made a quick run down to buy really high quality floss while I could still see the colors in person. In fact a lot of this project was only moved along with pushes from the outside world. I kept procrastinating the next step until I couldn’t wait any longer. The sashing? Well that was motivated by my local quilting store’s going out of business sale. I shopped there pretty frequently, but the threat of having to buy sashing fabric online was nerve wrecking enough for me to drag the squares down to the nice natural lighted store before I was left guessing shades against a computer monitor! I was so good about piecing the fronts and cutting all the strips for the binding and then the project just sat again…for months. I hit a rut in my sewing. I wanted to piece together the backs, but we were in a tight financial place and I couldn’t afford to spend money of fabric. I dug through my scrap bin and and found the leftovers from my dark green butterfly dress. It was lawn, not quilting cotton, but that’s okay! I also found left over rose print from the dress I made to wear to my bridal shower. The colors weren’t quite perfect, but with everything gathered I had just exactly enough to eek out two twin sized quilt backs. Not matching like the fronts, but similar enough. With the fronts and backs completed all that was left was the quilting and binding, but instead of just getting it done I stuffed it all in my sewing cabinet and forgot about it. Finally in some of the hottest weather this summer I decided to pull out all the supplies and finish these suckers. With lots of swearing and sweating I managed to mostly pin the layers together with a minimum of wrinkles. Only took 4 attempts. With the home stretch in front of me I couldn’t turn back. The pair of quilts were also threatening to take over my sewing space (our kitchen table). Once I got past the horrible pinning part hand tying the quilts was hot but easy work and the bindings went on pretty easily. These quilts are absolutely massive in their tiny toddler beds, but I hear a bunk bed is coming this winter! My hope is these snuggly twin quilts will be just perfect for many winters to come. My sweet baby. 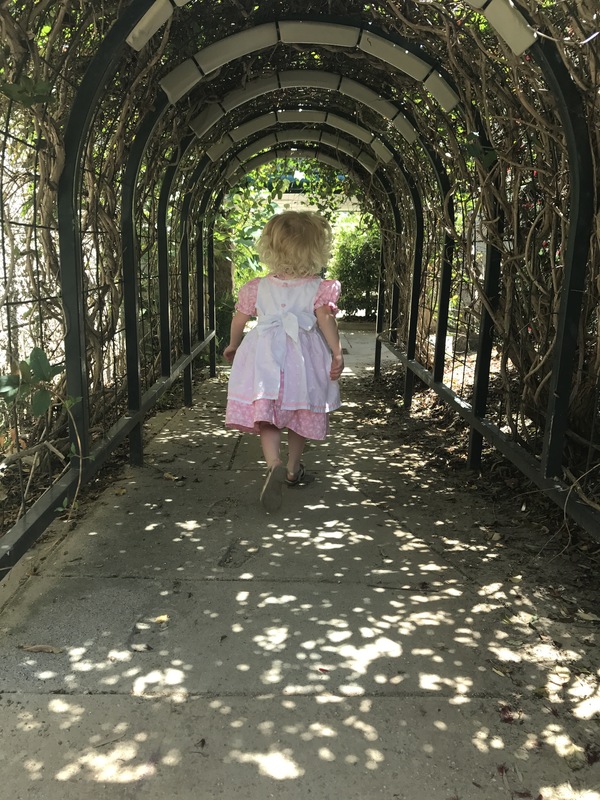 She’s on the cusp of turning 3 and becoming more independent with each day that passes. In this dress she looks like an angel. 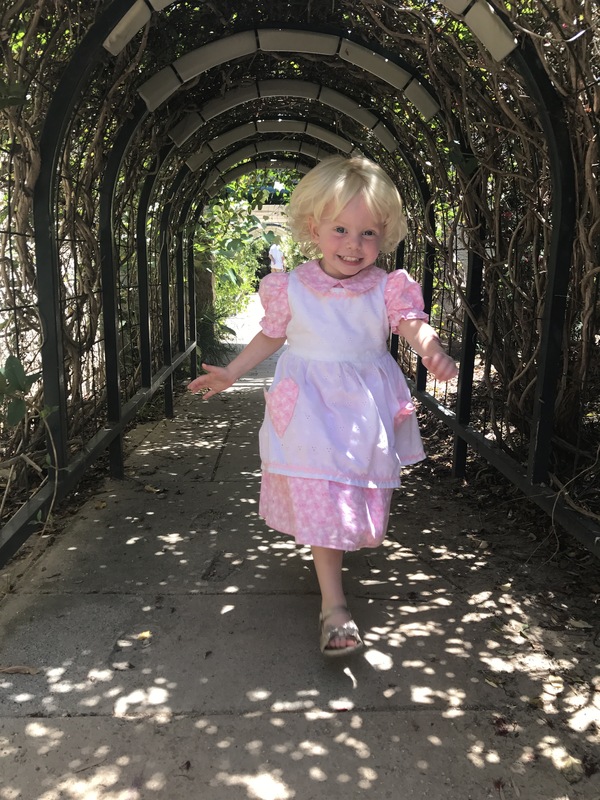 The dress pattern is Simplicity 9605 which was published in 2001, but this style has been popular for decades. In fact this dress is 15 years old. I made it back when I was 20 and my cousin was 2! My aunt held onto it for all these years hoping I would have my own daughter and she could pass it down. Luckily she found it before my girls grew out of it! She’s also lucky my kids grow slowly as I made a size 2. My cousin was also quite a tiny toddler. As you can see this dress is likely to get a lot more wear. YAY! Oh sweet goodness. Look at that Joann’s quilting cotton. 15 years ago that’s pretty much the only fabric I used to sew clothing. Most of the rest of the store was filled with polyester (not much has changed) and the wall of pretty cottons was so much more appealing to both my wallet and my taste in colors. Heart pocket! I’m thanking past-me for adding this sweet detail. Underneath is a full petticoat in the same pink cotton. All these layers give the skirt a nice body that is missing from a lot of other patterns. It was so fun looking at the guts of the dress and noticing which techniques I used finish seams and such. I don’t usually bother with much finishing work on clothes for myself, but gifts are a different story. I always make sure everything is neat and tidy. In this dress it looks like I tried to use the selvedge of the materials as much as possible. I didn’t own a serger or pinking sheers at the time. Charlie loves this dress. 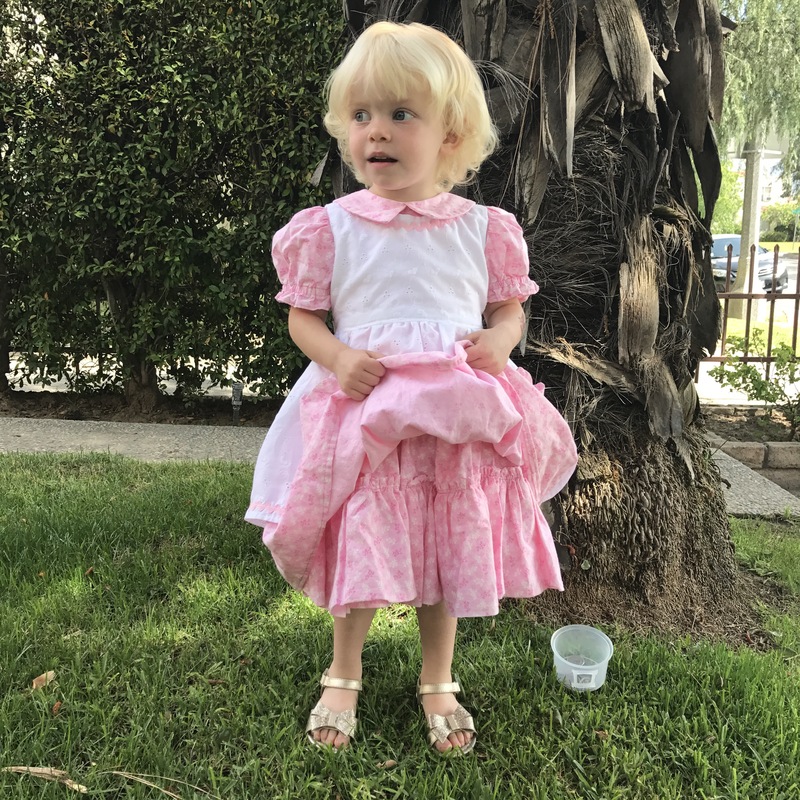 We started going to church over the summer and she always wants to wear her pink twirly dress. 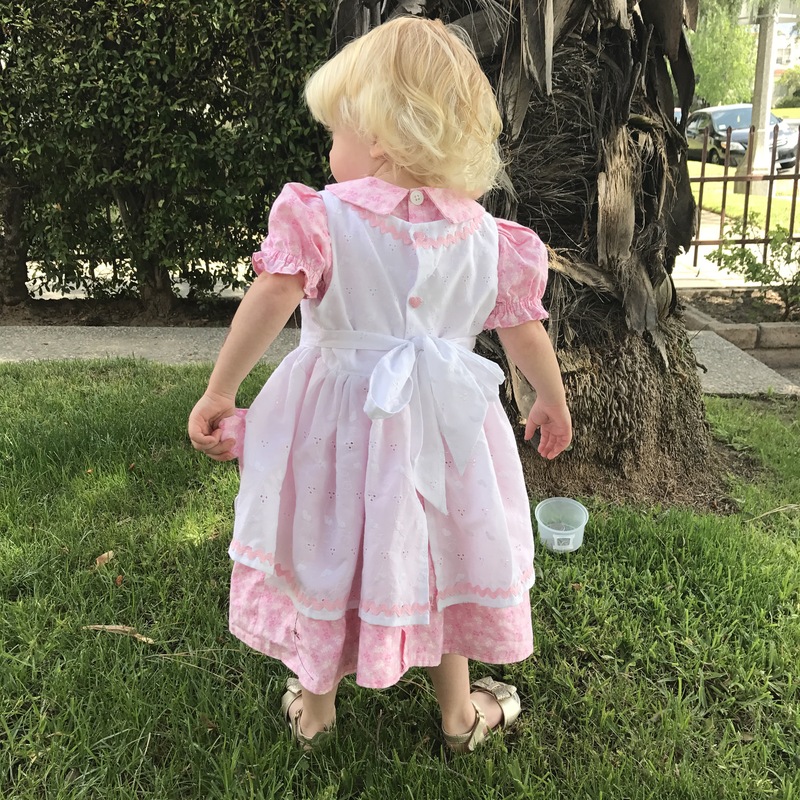 It is just perfect for wearing to service even though she mostly goes to the toddler room. In my opinion, one should always dress for church. And nearly every week one of the older ladies stops me to comment on Charlie. 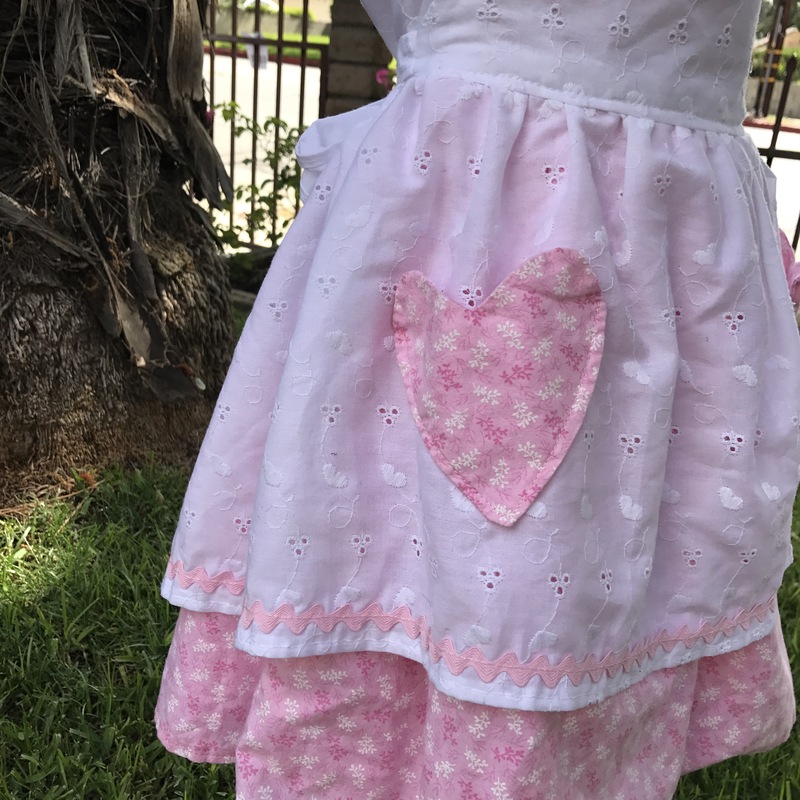 So many of them made dresses like this for their own daughters and it warms their hearts to see that someone still sews up these styles. Now I’m contemplating making this pattern again. I have some vague memories of it going together well even if more involved. 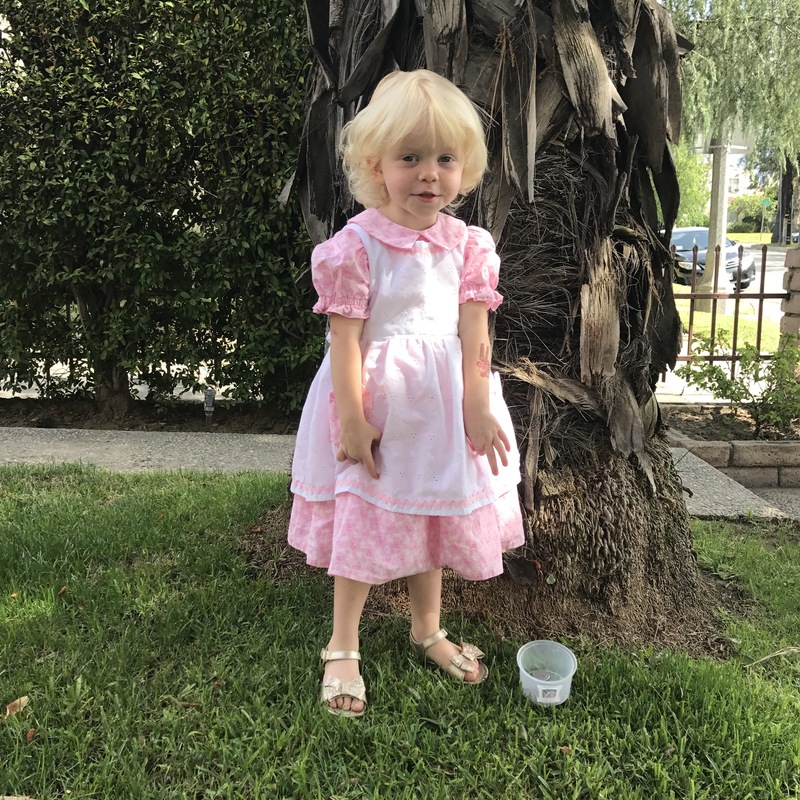 I’m thinking it would make a perfect Christmas dress for Charlotte because she’s too old for the style. Maybe I’ll make something similar for Lu. 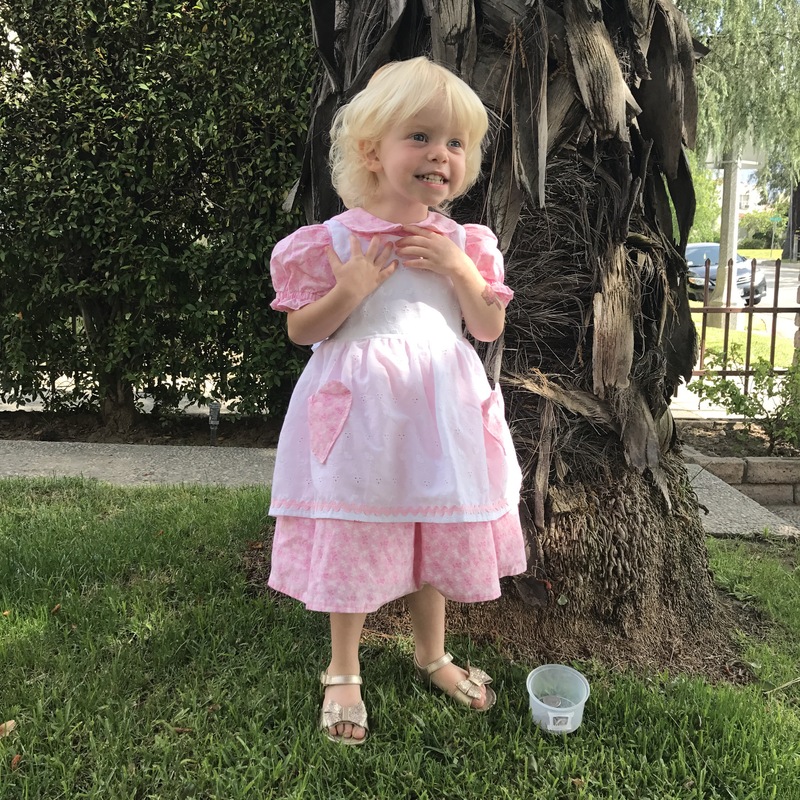 Is five too old for pinafores?